Welcome to the NBA Playoffs Star Power Index -- a weekly gauge of the players who are controlling the postseason buzz. Note: Inclusion on this list isn't necessarily a good thing. It simply means that you're capturing the NBA world's attention. Also, this is not a ranking. The players listed are in no particular order as it pertains to the buzz they're generating. This column will run every week through the end of the Finals. I've been hearing a lot that "most" people picked the Portland Trail Blazers to lose their first-round series to the Oklahoma City Thunder. Strange. I didn't get the memo. Turns out, the "Damian Lillard is a stone-cold superstar" camp is still pretty thinly populated. How is this possible that a large amount of presumably smart basketball people still don't believe in this guy's ability to carry a team? OK, I grant you the Blazers' 10 straight playoff losses coming into 2019. That's a bad look. It's also a lazy look to suggest that was some sort of indictment on Lillard, who gets as much -- if not more -- out of his roster as any player in the league. Now the Blazers are up 2-0 on the Thunder. Lillard has been, by far, the best player in the series. Why are we surprised? Somebody, please, tell me. There are those who will say there is nothing that can be done about a guy hitting 30-footers. You just, you know, tip you cap. Don't listen to them. If Westbrook doesn't know by now that Lillard will hit that shot in his sleep, and doesn't think he needs to close that space, then he's just not paying attention. No worries: Dame was courteous enough to deliver another lesson in Game 2, first daring Westbrook to clang his own 3 before Lillard pulled the trigger from darn near the logo on the ensuing possession and flexed his way back to the huddle. Lillard is just dogging Westbrook in this series. In Game 2, he had 30 points to Westbrook's 14. He was 5 of 11 from 3 while Russ was 5 of 20 from the field overall. Lillard was plus-27 for the game. Westbrook was minus-27. It's a bloodbath, and Lillard's holding the sword. Pay the man his respect. Or don't. He's going to keep killing either way. Earlier this year, a league scout told me this about the impact Kawhi Leonard was going to have on the Raptors in the playoffs: "In the past, they didn't often have the best player on the floor. Now, in a lot of cases, they will." It's funny, for all the analysis we try to dig up about these games and series, it really can be pretty simple sometimes. You have the best player, you have the upper hand. Think about it: The Raptors, by a mile, were a better collective team than the Cleveland Cavaliers last season, but the Cavs had the best player, so they won. Now it's the Raptors who will, arguably, have the best player in any Eastern Conference series outside of a potential date with Giannis Antetokounmpo and the Bucks in the conference finals. That's why they'll be favored through the first two rounds. Leonard -- with 37 points on 15-of-22 shooting, including 4 of 8 from 3 -- was sensational in Toronto's Game 2 win over Orlando, which evened the series 1-1. No, he wasn't enough to cure Toronto's historic Game 1 blues, but he was everything the Raptors needed him to be in not letting a one-game blip turn into a first-round scare. Leonard's pull-up game is off the charts. From 3, mid-range, it doesn't matter. Dude is going to get to his spot because he's so unbelievably strong and he has the release and length to shoot over anyone. 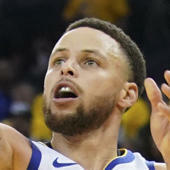 He's always talked about as a two-way player, which he obviously is, but being that "two-way player" is so often a term that is meant to qualify a player who really isn't at an elite level, constantly describing Kawhi as such almost diminishes the fact that he's flat-out one of the most unstoppable scorers in the world. The Bucks stomped the Pistons in Game 1 and they're going to stomp them in this series. In their first-round opener, Giannis posted 24 points and 17 rebounds in just 23 minutes. He was a plus-30 for the game. The Bucks won by 35. He also basically dunked from the free throw line after needing just one dribble to cover over half the court. What the Denver Nuggets' point guard did in the fourth quarter on Tuesday was a living illustration of two things: One, the power of self-confidence. And two, the power of other people's confidence, particularly your coach, who has a choice to either bail on a guy who's not playing well or keep believing in him. Mike Malone kept believing in Jamal Murray. And, man, did it pay off. Through the first seven quarters of Denver's first-round series with the San Antonio Spurs, Murray was 8 for 32 from the field. He was 0 for 6 from 3 in Denver's Game 1 loss. He was 0-8 from the field through three quarters of Game 2, in which Denver trailed, at two different points, by 19. The season was slipping away. Murray was ice cold. Then boom, he saw a free throw go through the net, and for a shooter, that's all it takes. The confidence was triggered. Murray turned scorching hot in an instant, connecting on 8 of 9 shots for 24 fourth-quarter points as the Nuggets rallied from the brink of death to even their series with San Antonio 1-1. Look at some of those shots, and remember this is a guy who couldn't hit water from the beach a few minutes earlier. Those are not cupcake shots to get a player going. Those are borderline ill-advised shots that are going to catch him a lot of flack if they don't go in. That's laying it on the line. That's a gunslinger. Murray's as streaky as he is brash, a much better version of J.R. Smith, a combination that can make him frustrating at times. But when it clicks, you get this. Dude is a problem when he gets going. But listen, even the best shooters and scorers in the world lose some confidence when they're not making shots. Mark Price, one of the greatest shooters ever, told me that. So we have to give some credit to Malone here. He kept breathing confidence into Murray's game until it came to life. This is not coach speak. This is real. At any level of sports, having the confidence of your coach, knowing you have it even when you're struggling, is huge for athletes. Second-guessing is contagious. There is only one word to describe the Clippers' 31-point rally to beat the Warriors in Game 2 of their first-round series: Miraculous. It's never happened before in the playoffs, and there's a good chance it'll never happen again in any of our lifetimes. Afterward, there was a lot of talk about how the Warriors quit playing and got sloppy and started turning it over and yada yada. All that might be true. In fact it is true, but it doesn't for one second diminish the crazy amount of shots -- tough shots at that -- the Clippers had to make in scoring 85 freaking second-half points. And Lou Williams hit a lot of them. Remember when people used to say Williams was an empty-stats scorer? That was fun. Williams is one of the 7-to-10 most-gifted scorers in the NBA. I really believe that. His transition from handle to shot is so smooth it makes him virtually impossible to guard. And he shoots from all angles. Fading, leaning, stepping back, pull-ups. He hit so many tough shots to keep that comeback vs. the Warriors moving forward. Williams has scored 61 points through the first two games of the Warriors series. He and Montrezl Harrell, both coming off the bench, have combined for 112 points. Simmons was utterly irrelevant in Philly's Game 1 loss to the Nets, and the crowd let him -- and the rest of the 76ers -- know about it. Afterward, Simmons said: "If you're a Sixers fan and you're going to boo, stay on that side." Bold move, Simmons. But he came out and backed it up in Game 2 with a triple-double to the tune of 18 points, 12 assists and 10 rebounds. He was aggressive getting into transition and attacked the cushions Brooklyn was giving him in the half-court. He has to do that for Philly to be successful. He is too much of a hindrance on the 76ers' flow and spacing when he is passive on top of not being able to shoot. He just becomes a body in the way. The Sixers are in a fight with the Nets, who have some real matchup advantages despite Philly putting on a show in Game 2. The series is tied 1-1. Game 3 is Thursday. Really strange start to the playoffs for Durant. He was ejected from Game 1 and he fouled out of Game 2 -- a game in which he took only eight shots and committed nine turnovers. I would say it's just Patrick Beverley getting completely under his skin, which is for sure part of the deal here, but Durant was oddly passive down the stretch of the regular season, too, almost like he was making it a point not to shoot or attack. Stephen Curry went nuts in Game 1 with 38 points (and 15 rebounds! ), so Durant pulling back a little bit there was understandable. But Game 2, Beverley just flat-out dominated him. He crowded Durant's space, used his leverage as a shorter guy to impact Durant putting the ball on the floor once he did get it. Durant was catching passes way farther from the basket than he normally does, he was off balance and generally didn't appear to want anything to do with the physical battle Beverley was bringing. Strange. That's all there really is to say. Durant better pick it up now that DeMarcus Cousins is likely out for the rest of the playoffs.